SPENCER, N.C. - For the first time in 25 years of operation, the N.C.Transportation Museum is offering a look behind the scenes. 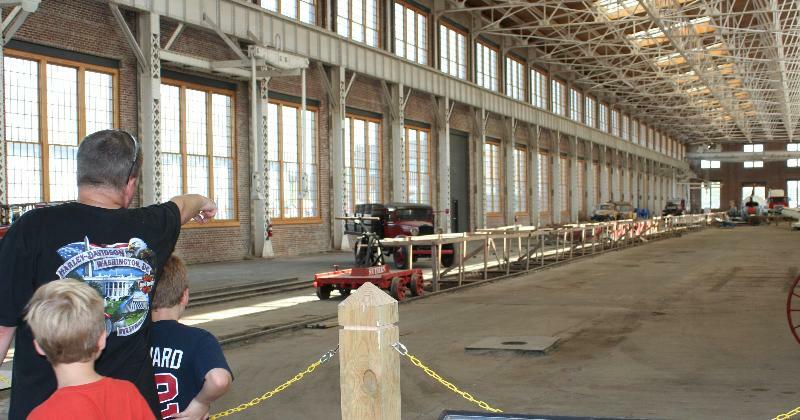 Those taking advantage of the museum's new "Behind the Scenes" tours can stroll through the enormous Back Shop, view the Roundhouse Restoration bays, and enjoy a tour through the private rail car of James Duke. "Behind the Scenes" tours open new areas of the historic Spencer Shops, while providing a unique view of museum artifacts and restoration projects. A stroll through the awe-inspiring Back Shop starts the "Behind the Scenes" tour. Visitors can marvel at how such a massive structure, three stories high and the equivalent of two football fields in length, was built in the waning years of the 1800s. Visitors will also get an up close look at the DC-3 Potomac Pacemaker, undergoing cosmetic restoration in the Back Shop. The WWII era airplane was used for passenger travel by Piedmont Airlines and still bears the company's logo. The Potomac Pacemaker is an important piece of the history of the Winston-Salem based airline, which became a part of US Air in 1989. While the aircraft is usually seen through the windows of the Back Shop during the on-site train ride or from a distance on the Back Shop visitor access platform, "Behind the Scenes" visitors will be able to stand beside the aircraft and take a peek inside the windows. Restoration of classic rail equipment is a constant process for museum volunteers. "Behind the Scenes" tours will show the work in progress with a walk through the Roundhouse Restoration Bays in the Bob Julian Roundhouse.